Looks pretty sweet. But kind of spendy! Yeah, I agree. The E-P5 price is $100 more than the E-P3 MSRP, and the E-P3 came with a 14-42mm kit lens. It is a much, much better camera, though. And I think they're targeting a higher-end market - the people who might buy a Fujifilm X-Pro1 or X-E1. This one is tempting for me, though. I really did love the E-P3 and I could see myself happily using the E-P5 for a long, long time. John I am really curious on the wifi. If you get a chance to check it out. My wife is big into social media and I would like to know how to post pictures with the camera. Is it done with an app? Please give us the low down on how it works. My wife's birthday is next month. Also can one transfer pictures straight to a phone? I am clueless about wifi cameras and also how is this different from the WiFi SD cards? I know I am not interested in the Samsung. I don't need a data plan. Plus the IQ isn't good. I know you're a fan of the Olympus Pen cameras and I think the E-5 looks great. But since the E-P5 was announced a couple of new options have come on the market. I know you said you aren't interested in the Samsung. I assume you were talking about the original Galaxy Camera that I reviewed earlier this year. But since you posted, Samsung announced a new Android-powered Galaxy NX mirrorless camera, with full 4G mobile connectivity. Like the original Galaxy Camera, though, I think it's not quite there. It's still an interesting camera and it deserves attention. I really think Samsung deserves recognition for going out on a limb and being the first to make real cameras with mobile connectivity. The new Fujifilm X-M1, announced on Monday, also has built-in Wi-Fi. As you know, Fujifilm's X-Trans sensor is the best you can get in a mirrorless camera right now. And you can get the X-M1 for just $800 with a 16-50mm zoom lens. I think Fujifilm is going to sell a ton of X-M1's. But like I said, I know you're a fan of the Olympus system, and I am, too. I still think it's got the best overall balance between size and performance. And they absolutely have the best lens options. Set your wife up with an E-P5 and the 14-150mm zoom and she'll be able to shoot pretty much anything - and post it straight to the Web. Thanks John I was also thinking the NEX 6 was wifi. The other question is picture size on uploading. I know the small 6 mpix files from a phone upload in a snap. I can imagine big files would have slow upload times. I like the idea of the EP-5. I have found myself with another OMD E-M5 simply for its size to work on a time lapse slider and also the OMD E-M5 and 75-300mm lens is a much cheaper alternative to the lack of a super zoom on my a99. Though I am presently horse trading to get the 75-300mm. We had a nest of eagles move in to Rome this spring and by Federal Law 330 ft is as close as one can get to the nest. I suffered from not enough zoom and a dead Bigma. 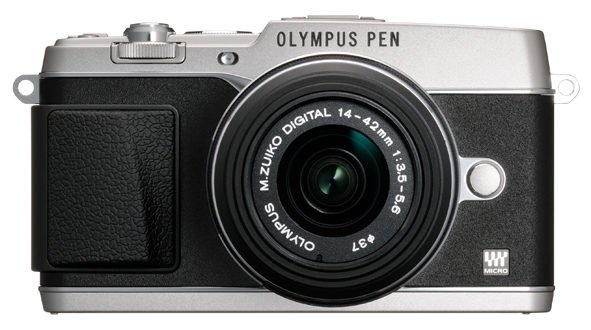 The x2 crop factor is very helpful along with the great IS system Olympus has. You're right - the Sony NEX-6 also has built-in Wi-Fi. Sorry about leaving it out. The Fujifilm and Samsung were both fresh in my mind since they were both just announced. File size is a definite concern. With my point-and-shoot, I resize the photo in my camera before transferring it via Eye-Fi card to my phone. I think most cameras have some built-in image editing capabilities now. I'd say check your E-M5 and the E-P5 specs to make sure it can resize images in the camera. I'd be surprised if it didn't though. Though I am presently horse trading to get the 75-300mm..
Any "luck" yet on the current attempt at this "Horse Trade" dealing?